This is a recipe that I cooked over 20 years ago for my parents and they loved it, I made it quite a few times for them. However when I moved out of my parents place, I had lost the recipe. And as I have the memory of a goldfish, I couldn't remember it. Then one day I was flicking through a folder I had at home and I found the recipe. So off my husband went to the fish markets and he bought some crabs. My neighbours came over for a last minute get together and I was serving this dish. I hadn't made it in so many years, even I forgot what the end result will be. Well, we got so messy eating the crab, it is messy, but we were all licking our fingers, the shells, and picking at all the deliciously flavoured crab meat, it was lovely. The sauce was delicious. We were a mess in the end, but it was so worth it. I was very tempted to call this recipe "I gave my husband crabs tonight" (sorry, had to put that in, as he loved this dish). 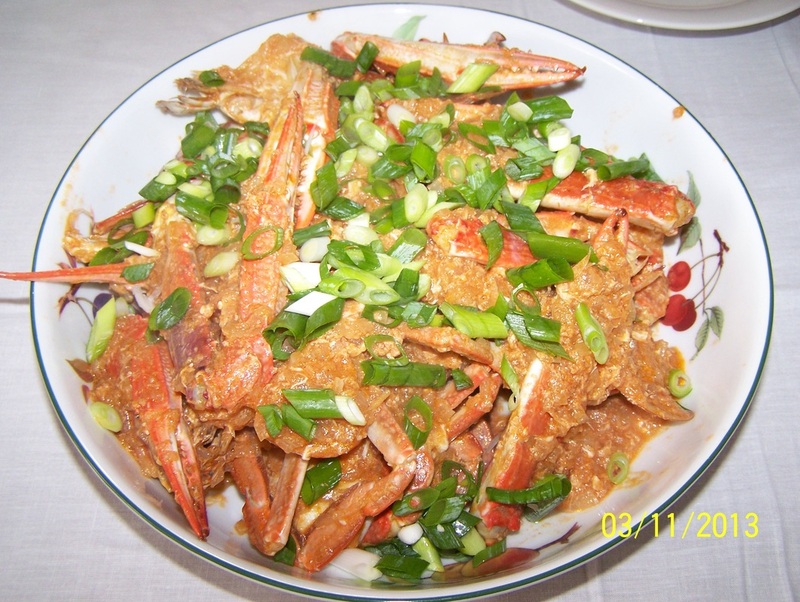 But I though not in the end, kept it as stir fry crab. Heat a wok over medium-high heat and add the oil. Stir fry the onion and ginger for 2 minutes, until the onions begin to soften. Add the crab and 2/3 cup of water. Simmer, covered for about 3-5 minutes, stirring occasionally. The crab will start to go orange in colour. Add the chilli-garlic sauce, salt, sugar and tomato sauce. Cover, allow the dish to cook for another 3-4 minutes, stirring occasionally. Finally, pour the beaten egg over the simmering dish, stir it through quickly so it doesn't scramble, and cook for a further 1 minute. Taste the sauce for seasoning. Transfer to a serving plate and top with the sliced spring onions. Serve immediately.